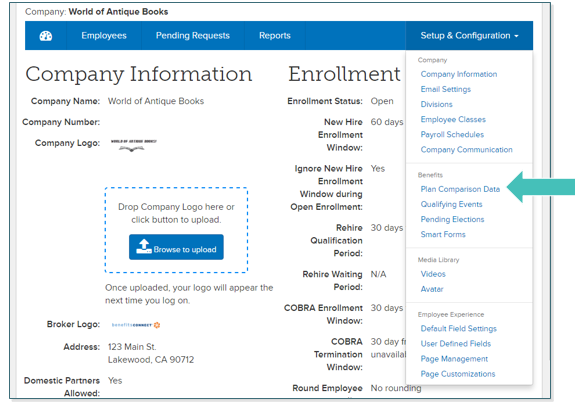 Click on Setup & Configuration, and from the drop-down menu select Company Information. 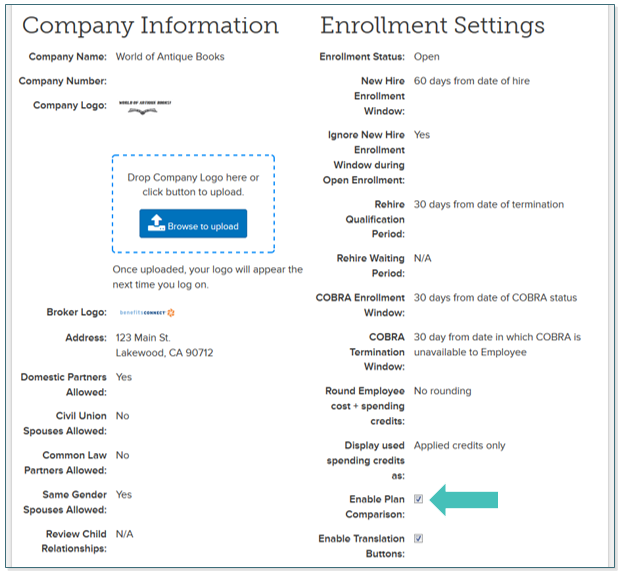 Check the box next to Enable Plan Comparison under the Enrollment Settings column. Click on Setup & Configuration, and from the drop-down menu select Plan Comparison Data. Once you click on Plan Comparison Data, you will see benefit plans that mirror those built on the administrative side of benefitsCONNECT®. To add data criteria for plan comparison, Click on Manage Plan Comparison Criteria. Under the box titled Name, type the naming convention of the plan point to be compared. Under Benefit, use the drop down menu to select the plan type. Click Save. This is now considered a Data Point. Repeat steps 4-7 until you have listed all the Data Points you would like to compare. Click Back to return to the Plan Comparison page. Click Edit on each plan to add the comparison data. Enter the Plan Specific Data under each Data Point. Repeat steps 10-12 until all the Data Points have criteria listed.